Yesterday was a very long, hot day for me, standing on the Manila docks. 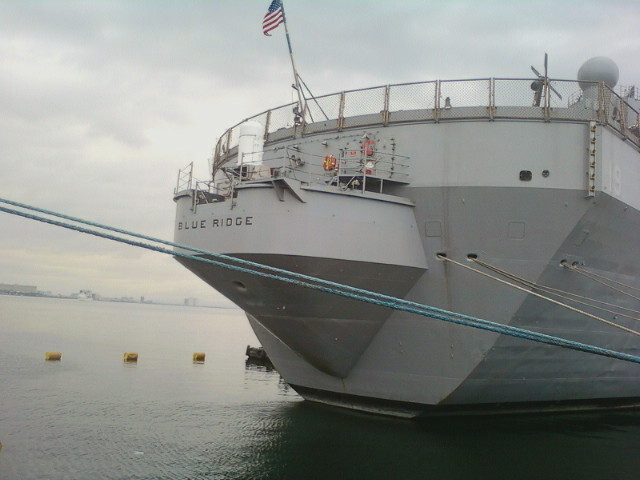 The USS Blue Ridge was in, and on a busy schedule of media and community events. Embassy personnel have the opportunity to tour the ship and I helped out with the buses and strict lists for who can board the ship. 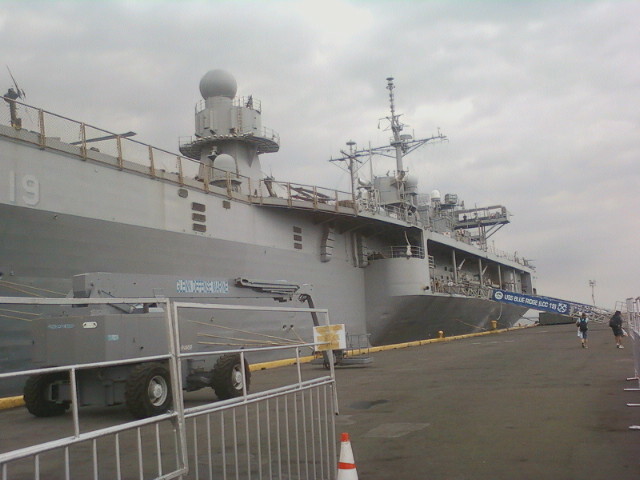 Its been years since I hung out for hours on hot, smelly docks watching all the activities. Fortunately they provided us with a tented area and cold water. I took an umbrella for sun and rain protection, although both both never really made an appearance. It was just hot, humid and a bit pungent around there. It did bring back memories though of our cruise ship years, and sitting waiting for ships to arrive in the strangest of places. All docks seem to have the same look and smells though…and Manila was no different. I wasn’t able to board the ship because there was always a reason I had to be dockside, although 99% of the time I just sat there. Sitting and watching the world go by on the docks can be sort of interesting in a relative kind of way. (More interesting than -say – watching paint dry!) And I did see scores of US sailors returning from shore leave, hauling all sort of different treasures that they had bought from nearby Mall of Asia. The passenger ferry next to me had a full wash along the port side, dozens of trucks filled its belly and by the time I was ready to leave, I watched hundreds of passengers board the ferry for Dumagete, (our Christmas destination, although we will be flying). Not a day to recommend as a good day out, but an interesting slice of life nonetheless…. ← My Forever Disappearing View…. Pearl Farm, Zamboanga, or going North I. the Batanes Islands which my husband wanted to visit someday, Take care and have fun in your OTTA Nowhere journeys! Can’t go south unfortunately. We are prohibited from visiting because of the kidnappings etc. But let me know if you are coming thru Manila at some point. Maybe we can meet up?